In the bowl of a stand mixer, combine flour, salt, sugar and yeast. Add in egg, butter (in small cubes) and buttermilk.and mix on low speed until just combined. Knead on a floured countertop or in the stand mixer (fixed with dough hook attachment) for about 10 minutes, or until dough is smooth and elastic. It should also read about 80°F with a meat thermometer. Pour the dough into a lightly greased bowl, cover and let rise until doubled, about 1 1/2 to 2 hours. Once dough is risen, pour out onto a floured countertop and flatten, using fingers, into a rectangle, about 6 by 8 inches. Roll the dough from the short end like a jelly roll shape, pinching the seam closed as you roll to tighten the top of the loaf. It might get longer as you roll it; this is normal. Place rolled dough lengthwise in a lightly greased 8 x 4-inch loaf pan, spray the top with cooking spray, cover and let rise until doubled, about 1 to 1 1/2 hours. Uncover the risen loaf. Using a serrated knife, make a shallow slash lengthwise across the top of the loaf, if desired. Bake in the oven about 30 to 40 minutes, or until a golden brown. The dough should also register about 190 °F inside, and make a hollow thumping sound when thwacked on the bottom. This is how you know it's done. 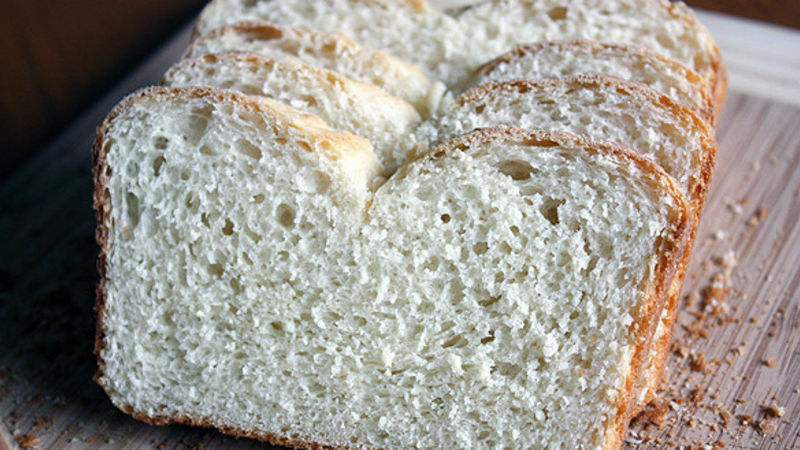 Remove from loaf pan and allow to cool completely on a cooling rack before slicing or serving.